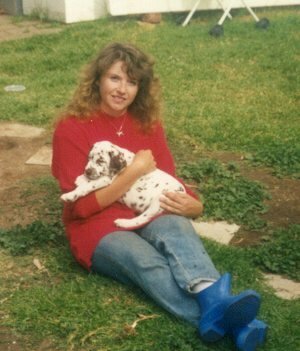 Jendally Kennels began in 1990 when as a family we purchased our first Dalmatian, a black spotted female who we called Shelby. Shelby was a wonderful addition to our family and provided me with an introduction to obedience and the VCA,. I had never owned or trained a dog before Shelby so she was a great teacher and together we learnt so much. She was also a wonderful and valued family member. Shelby became known as – DALYVERE CHELSEA ROSE CDX AD ET. In 1993 we decided to add a male Dally to our family and we also decided we would love a liver spotted Dalmatian this time. Along came Reebok – GR CH DIMADAL IMA KNOCKOUT CD ET. A knockout he certainly was and Reebok was also my introduction to dog showing. Wow, what a great introduction it proved to be. Reebok was one of the top winning dogs of his time and became a Grand Champion in novice hands and from only dog challenge points. Reebok features in the pedigree of every Jendally Dal and is our foundation.. A more loyal and loving companion could never be found anywhere. Our next dally was a son of Reebok – a black dog called Kodak – CH DIMADAL LIMITED EDITION a Runner up Best in show and multi class in show winner. Kodak was predominantly handled by Nate who was only 13 yrs old at the time. Next came Elle – CH BERNATION SUPER MODEL CD ADM JDM ET who was such a wonderful ambassador for the breed with her amazing success in the agility ring. 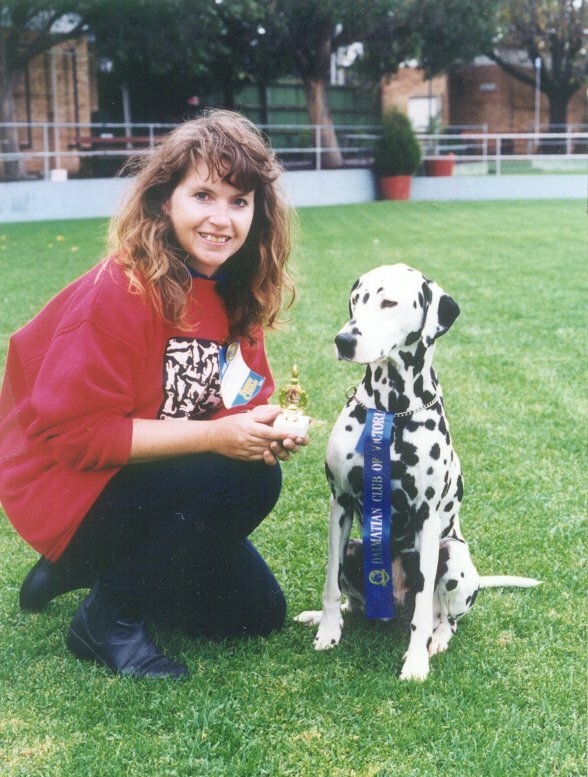 Elle is still the only female Dalmatian to have a double masters title in the world. Elle was also a very successful show dog and to this day is still a much treasured companion and member of our family. Elle has also been a wonderful producer with children, grand children and gr grand children still setting the standard and achieving success. Our first home bred Dalmatian was born March, 1998 and with her the birth of our prefix JENDALLY. Our first champion was Violet – CH JENDALLY AUSSIE EUREKA TQT ET. and our second Jendally title was her brother Tigger – JENDALLY AUSSIE EDITION ET. Violet produced two litters. From her second litter came Maia – CH JENDALLY FIRE N RAIN ET and the gorgeous Elvis – CH JENDALLY RETURN OF THE KING who was probably the most treasured dog that I have ever owned. Elvis was a lovely soul with a gentle nature with humans and dog alike. Sadly in June, 2007 at the very young age of 4 yrs Elvis died suddenly from a blood clot to the brainl. The worst moment of my life and a huge loss for our kennel and the breed. At the time of his death Elvis was a hugely successful dog with over 500 challenge points. He has left a huge hole in my heart that will never be filled. Fortunately we have a little part of Elvis still in our lives in the form of his daughter Bella – CH/NZ CH JENDALLY JEWEL IN THE CROWN ET who also has over 500 challenge points, an australian and new zealand champion title, her Endurance title and is also a wonderful ambassador for the breed through her work in the Responsible Pet Education Program which her sister Steffi and father Elvis were also heavily involved in. We also have another two daughters of Elvis – Steffi, CH JENDALLY MAGIC MIST ET(Class in Show winner) and Maggie May, JENDALLY MAGIC MOMENTS. Elle produced our second Jendally Champion with a son Nike – CH JENDALLY BOLD NIKE HEIR ET. (Multi Best in Group and class in group winner, puppy dog of the year and royal class winner). Elle also produced Taylor – CH JENDALLY EXTRA SPECIAL ET, who in turn produced our hugely successful dog BOND – GR CH JENDALLY NEVER SAY NEVER who won Top rising star 2008. 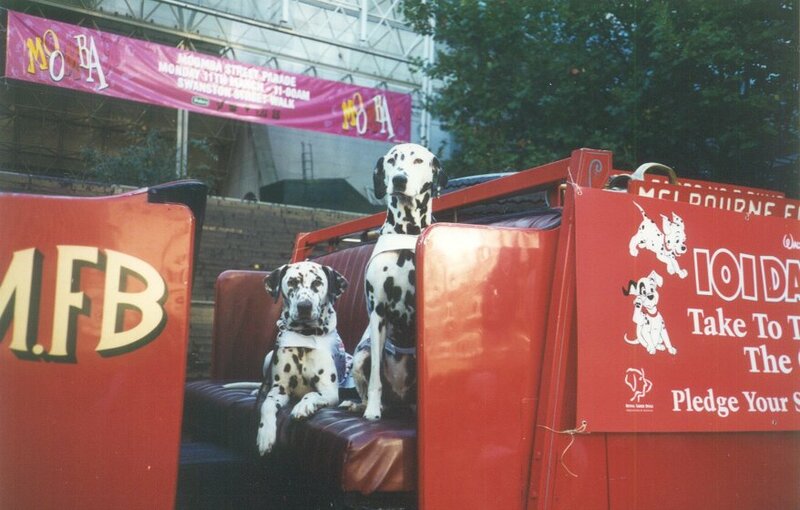 Number 1 Dalmatian male (BOB) in Australia 2009 and Number 1 Dalmatian (BOB and ALL BREEDS) in Australia 2010. Puppy in Group Melbourne Royal 2008 and RCC Melboune Royal 2009 & multi classes in show, and best in group wins. Bond became a champion at the age of 12 months and one day with a best in group from Dalmatian specialist – Diane Boyle and became a Grand Champion at the age of 2 years and 6 months again with a best in group and a class in show win. Taylor is also the mother of Misty – CH JENDALLY LUV IN THE MIST, Thomas – CH JENDALLY LUV ME TENDER, Tim Tam – JENDALLY LICENSED T LUV CDX, Steffi – JENDALLY NEVER NAUGHTY (multi class in group winner close to tite), Domino – CH JENDALLY NAUGHTY BY NATURE (multi class in show winner), Ayessa – JENDALLY NAUGTHY BUT NICE (Exported Phillipines) Also special mention to the lovely Paris – JENDALLY LUV AT FIRST SIGHT who is the mother of Ace – CH JENDALLY PLAYING THE GAME, Jazzmine – CH JENDALLY PARIS IN SPRING and two of our three Amercian exports. Jendally Kennels have come along way in just 10 years and have produced many champions and performance titled dogs. We have also exported Dallies to USA, Phillipines, New Zealand and Germany. And we have had the pleasure of providing many wonderful people with a much loved family member. A Violet son, Harley – CH JENDALLY KING OF WOLFCUBS (Exp Germany) was exported to Germany to the home of Anke Dahl and has had a hugely successful show career in such a short amount of time with countless ‘excellent’ awards and challenges in France and Belgium. Harley is also the proud sire of multi European Champions We are very proud of our boy and wish him much success with his European campaign. Some of our more recent success stories are Kylie – CH JENDALLY IMPOSSIBLE PRINCESS, M.J – CH JENDALLY SMOOTH CRIMINAL (A multi best in group winner and 5 times Australian Champion before the age of 2 years), Aqua- CH JENDALLY AGE OF AQUARIUS, Stubby Rose – CH JENDALLY FIRE ROSE, and the fabulous Outback litter – Dex – CH JENDALLY OUTBACK WIZARD and his sisters JENDALLY OUTBACK SPRITE JD AD and JENDALLY OUTBACK OPAL AD. Of course the other talented member of this family is Jack – CH JENDALLY OUTBACK JACK. Type, Balance, Temperament has always been the main focus of our kennel. Now to the present – and Jendally Kennels is now made up of myself, Jenny, and my son Nate and daughter Tara. Nate and Tara enjoy campaigning our dogs and are extremely talented handlers. They have grown up with a love of dogs and enjoy everything about having them in their lives. We look forward to the future and we remain extremely proud of our past.